Westcon’s team helps ensure you derive added value from a growing services portfolio structured to build margins, reduce operating costs, and create new revenue streams. Profit from our expertise to support your practice and Check Point Software Technologies solutions. Visit Westcon Services or contact your Westcon Account Manager to learn about all we can do for you! 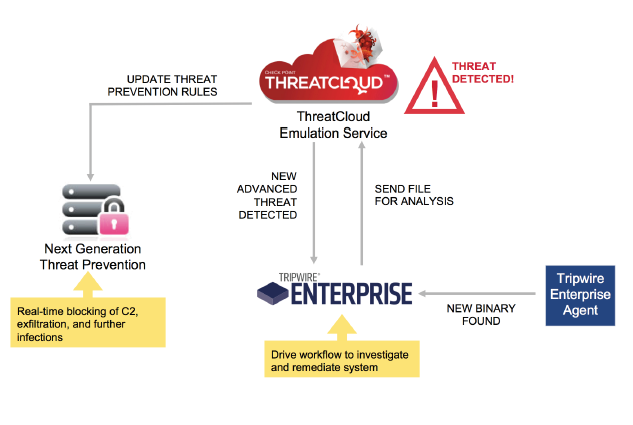 Tripwire® Enterprise provides real-time endpoint monitoring and detection, enabling advanced cyber-threat protection with malware verification and identification through integration with Check Point® ThreatCloud Emulation Service. Together, Check Point and Tripwire Enterprise reduce the time to accurately detect and protect against advanced threats. Automatically review system binary changes for known and advanced threats, ensuring malicious changes are detected rapidly. Accelerate the time it takes to detect zero-day threats and quickly determine endpoint risk priority to take additional actions. Reduce the time to remediate critical threats by prioritizing security actions based on changes to systems affected by threats Check Point ThreatCloud identifies. Deliver enhanced protection against undiscovered exploits, targeted endpoint attacks and zero-days – and avoid repeat attacks. Contact your Westcon Account Manager to begin selling this powerful solution.